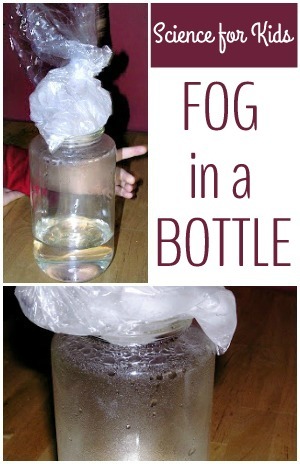 An easy-peasy science experiment for kids to help them learn about the weather: make fog in a bottle! If your kid likes to write his name in the bathroom mirror he may enjoy this project. Best of all, it requires little preparation and almost zero cleanup. 1. Fill a jar or bottle with HOT, HOT water for 60 seconds. 2. Pour out most of the water and then place a plastic bag with ice cubes over the top. 3. Fog will start to form inside the bottle. And here’s the interesting part… while the adult will find watching the bottle akin to watching paint dry, the kid will be fascinated with watching how the fog forms, then water droplets form and then water drops run down the inside. You can mess around with explanations if you want to. Kiddo was not really into the whole air condensation explanation and truthfully, our science experiments are mostly about laying a foundation and fostering curiosity. Of course you can always fog up a bottle, by just breathing into it. You can find more science projects on my pinterest board or on my Giant Indoor Activities List.